Operational efficiency in shipping is a condition for staying in business. Increasing crew awareness and knowledge of accurate fuel consumption is key to getting the most out of improvement projects and new procedures. And measurement accuracy is the cornerstone of securing the added profit when optimising the operation. Maritime operation requires a high degree of attention towards operational efficiency and awareness on board vessels, both as a way to reduce costs but also due to legal and environmental requirements. Knowing your operation and basic consumption is a prerequisite for being able to determine fluctuations, and identify if/why an increased consumption has occurred. It is also important to know basic consumption when optimizing via performance improving investments in systems or equipment. Since 50% – 70% of OPEX (Operating Expenses) is constituted by the cost of fuel, always knowing actual fuel consumption is worth your while. Add to the fuel cost the continuously increasing requirement regarding environmental issues; documenting your vessel’s number one contributor to emissions – the fuel – via an automated system will provide you with constant certainty of your emission levels. Measuring fuel consumption accurately and continuously is an obvious “low hanging fruit”. How much fuel is consumed on board a ship, is directly related to the performance. The better the performance, the lower the fuel consumption during operation. In this equation accuracy is not negligible. An offset of 1% in measurement on a vessel operating 200 days a year consuming an average of 100 tons a day equals an offset of 200 tons a year. Depending on the price of HFO or MGO used, this misread has the potential to range up to USD 100,000. 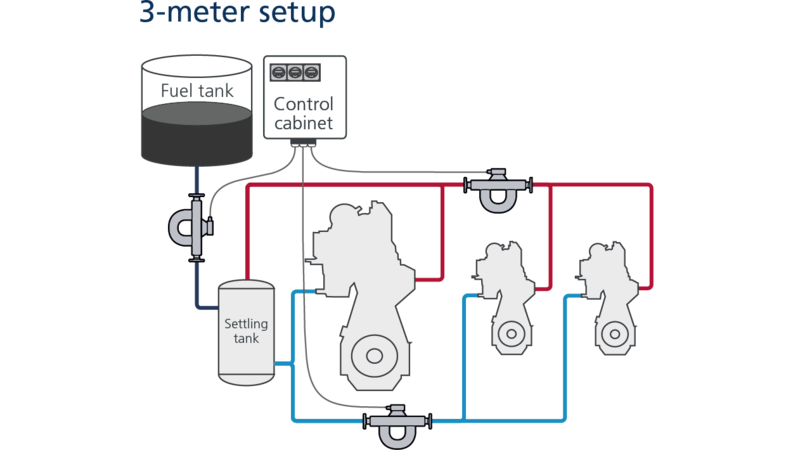 The Coriolis Mass Flow Meters used in our Fuel Consumption System has an accuracy better than 0,2% of nominal flow directly measured in mass, whereas most volumetric flow meters are in the range 0,5% to 2,0% – and they rely on volumetric conversion which depends on the temperature to calculate a mass flow. Know when you make money - and make more! Without accurate measurements of the consumption of fuel on board, it is truly difficult to determine what effect any changes in installations, procedures or maintenance has had. Relying on either noon reports or measurement instrumentation of lower accuracy can make it very difficult to know the exact benefit of fuel saving projects – or at least delay the proof. Thus the installation of a Fuel Consumption System is a way to increase your competitive advantage by freeing your crew’s hands from operation and maintenance of the instruments, which allows them to focus on their primary task: Optimizing the efficiency of the ship and thereby increasing profits. The Fuel Consumption System can also be upgraded to the Performance Monitoring System. 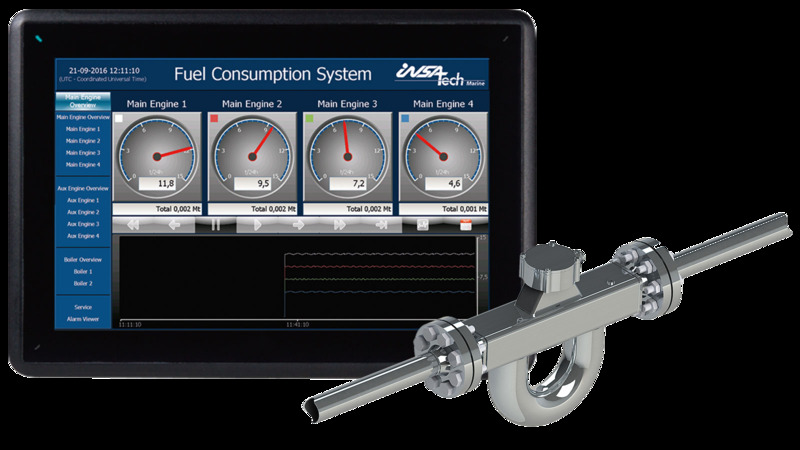 The Fuel Consumption System lets the fuel consumption data work for you to increase crew awareness, consumption trending, maintenance planning, etc. It works by utilising a number of mass flow meters to measure the fuel consumption. The flow measurements are collected, logged and displayed on an operator interface, which can be placed where ever you need it. 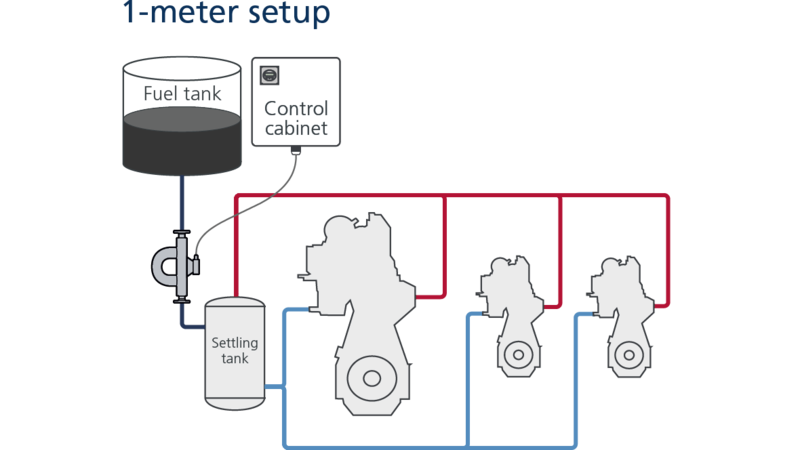 By installing one or more mass flow meters (depending on engine supply line layout and desired insight) fuel consumption can be monitored closely in real-time. The main principle is to measure the flow of fuel before and after the engine and/or generators. When you compare the consumption data with measurements of actual speed and position (based on speed log and GPS signals) you are able to directly measure the fuel efficiency. * If you require more detailed readings, additional flow meters can be installed, for example one set of meters per consumer or one set for the ship’s entire consumption. The measurements from the flow meters will be sent through Modbus signals to a collecting and processing cabinet with built-in or remote screen. Here the consumption will be calculated, displayed and logged. If you want the data sent to headquarters this requires the data link option which consists of two databases: One on board the ship and one at headquarters. Data will be sent at the frequency chosen between the two databases. 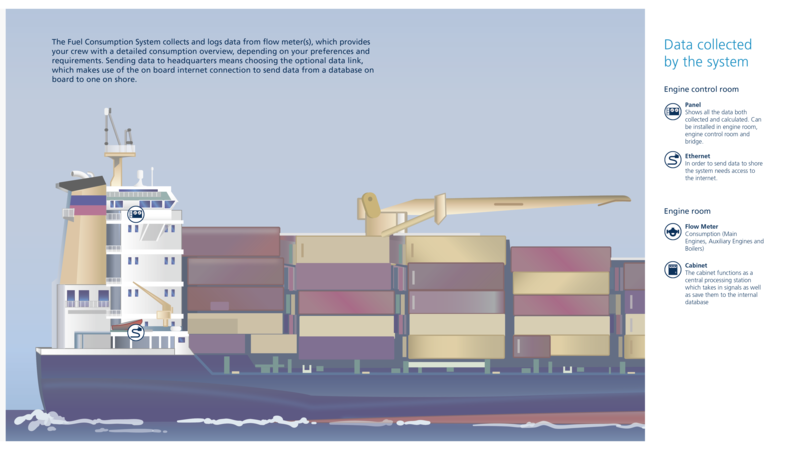 If the ship does not have an internet connection for a period of time, data will merely be stored and sent home once the connection is re-established. Monitor the ship’s consumption trend over time toimprove your maintenance planning. Once installed the Fuel Consumption System is easily operated. The operator panel can be placed in the engine room, engine control room or on the bridge, depending on your use or preference. The interface is intuitive and provides a fast overview of the different consumers, ensuring the crew gets the necessary information in order to take action. The Fuel Consumption System is fully automated and does not require any hands-on operation during normal conditions. The operator panel displays the measured consumption and has different options for showing data, but otherwise needs little attention. The data displayed depends on the system you choose to install, from the smallest system which simply shows the consumption of one or two consumer groups, to more extensive systems that display a large number of consumers. The system does not need any input or activation to run once it has been installed. The display of the main engine overview provides a total view of the main engine’s fuel consumption. A consumption trend line shows an accumulation of the most recent data. The setup is dependent on the number of installed meters. If you want a more detailed view, simply select a main engine from the overview screen. From here it is possible to get the actual and total consumption of the given engine, as well as values for engine inlet and outlet such as mass flow, volume, density, temperature and total mass. From the Aux engine screen you get an overview of all your auxiliary engines’ consumption. As with the main engine overview, this also provides an easy to read display of consumptions, trends and engine loads. The service parameters displays raw data for each flow meter related to consumers. It shows the main menu data and provides the possibility for a manual totalizer. From here the alarm status screens are setup. Furthermore the green light shows that the communication between flow meter and system is intact. Insatech Marine offers a broad variety of system setups all depending on which requirements you need. If you any questions you are always welcome to Contact our expert for more information. Big data: Its role in the maritime industry today and its ability to optimize vessel performance , plus its future potential.